We enjoying learning “English.” Proper English. It is an ongoing lesson, and we are having a ball. Liaise– To communicate with someone. I like this because I don’t know whether to tell someone to call me, text me, e-mail me, write me, come by, or talk to me in person. So let’s liaise. A sign from the Tube showing you the way. Fly Tipping–I saw this one in a headline first. Then I saw it on a sign outside a tip, er, dump. Basically “fly-tipping” is dumping illegally. Don’t tip your trash on the fly. That would be wrong. 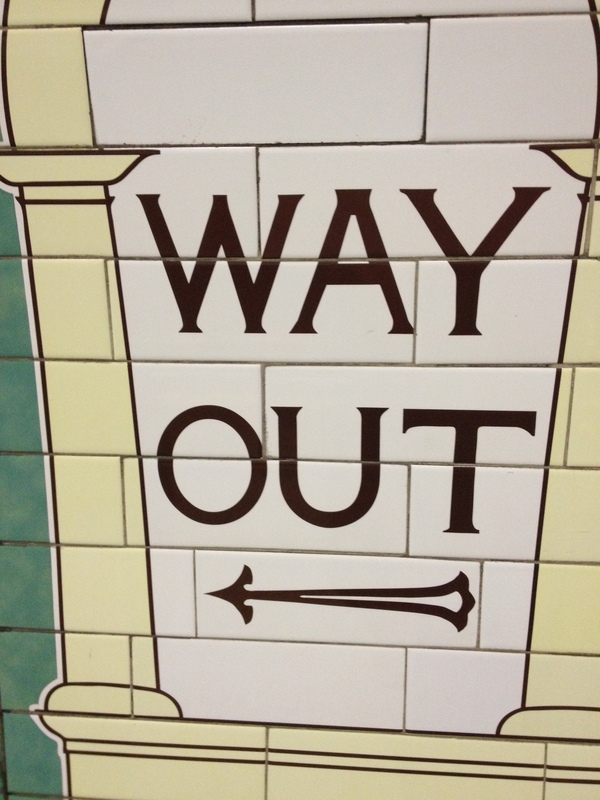 Way Out–Much better way to say “Exit”, don’t you think? Cheers–This is a term that means, “Thank you”, “see you later”, “come again”, “I appreciate you”, “you did a good job”, “well done”. It is not necessary to raise a glass of ale when you say “cheers.” I actually haven’t seen that at all. Instead, you say “Cheers” when you leave a place of business, get off the bus, or leave your table at a cafe. “Cheers” is a nice way to say many things. Brrrrrrrush–We were in a hotel in Scotland, and we realised that we forgot a comb. I went down to the front desk to ask for one. I had a hard time liaising with the gentleman behind the desk to explain my query about a comb. Finally he said, “Oh, you mean a brrrrrrrrush.” He held up a 6 inch plastic comb with pride. His “rolling R” was longer than the comb. Clamming–this is Geordie slang for hungry. I think I am going to weave this into a proper conversation in a restaurant one day: “Excuse me, I have a query. Could you liaise with your colleague about the status of my meal? I am clamming and if my food doesn’t come soon, I may have to find the way out. Cheers.” Well, maybe not. Love it! Thanks, Rob, for bringing Britain to us! Rob, I was on the floor laughing after the first sentence! I can see you pushing the send button and saying, “Oops!” The entry was hysterical! Have you noticed that you two already use the British spelling of many words. I hope these new words you’ve discovered always stay a part of your vocab. This school year is going too fast! It’s already January. I think this is probably the best of your wild list of occupations, hobbies and experiences yet! How will you top it?? Cheers!!! I miss you bunches!! !